Botanical name of the purple fruited pea eggplant is Solanum trilobatum which is called as Thuthuvalai in Tamil Language. There are lot of medicinal plants available in our fields which we don't know about their medicinal value or it's medicinal uses. One of that is Purple Fruited Pea Eggplant and it is called "Thuthuvalai" in Tamil which has whole of medicinal properties and also used in our day to day life even as food. This plant is a creeper variety commonly grown in bushes. People use to grow in their own farm land or garden for their own use as ingredient in the daily food. You can make plantation of this plant to earn money by selling fresh leaves or even collect those leaves, dry it, make it as a powder and sell in the market. Now a days people are aware of the medicinal property and interested to buy. Stems and leaves are fully covered with thorns. Dry these leaves, make it as powder and use it in our daily food. You can take a teaspoon for this power in a glass of milk daily will completely rid of cold and cough. Fresh leaves can be used for making chutney. It is also used for preparing soup. 1. Very good for curing Asthma, Cold, Cough and Flu. 3. Helps to produce blood and increases blood circulation. 4. Thuthuvalai leaves helps to reduce heat and gas related disorders in human body. 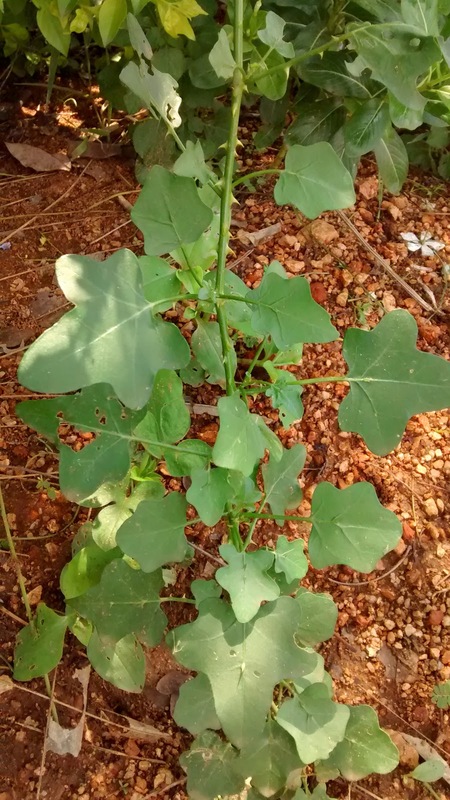 Leaves of this plant is best to be used in preparing "rasam". Pound the leaves with other dried spices in mortar and boil to make rasam. "Thuthuvalai Rasam" is popular in Tamil Nadu state of India and it is good in balancing the body tridosha system. It has been called as kayakalpam in siddha medicine. Thuthuvalai can be planted in dry land with minimal rainfall. Collect seeds from farmer, plant some seeds in a pot, let it grow for 30 cm and then plant those in your garden. You can grow this also in a pot.